1. String on 12 beads, alternating colors, two of each color at a time. Start with 2 gold and end with 2 purple. This will be the 1st and 2nd row after you complete the next step. Leave a 5-6 inch of thread. 3. Wrap the bead into a cylinder so that the “in” and “out” parts mesh. Use the thread still on the needle to weave back and forth, “zipping” the two edges together. At the top, tie the two thread ends together, and work them both back through your work to bury them. Can you tell how to read this? I'm so very confused. I think it's referring to the common convention of row 1 ending up being the first TWO rows after you add the next. So you pick up 16 groups of 2 beads to start out, moving towards the right. 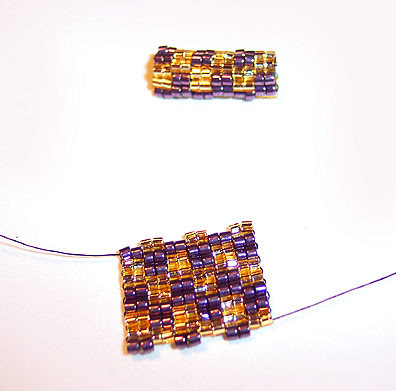 Then you stitch across adding 8 groups of 2 beads, moving towards the left. Repeat this last step, moving back and forth across, adding 2 beads each time for 8 stitches.